I don't remember throwing wildflower seeds out last fall- but I must have. 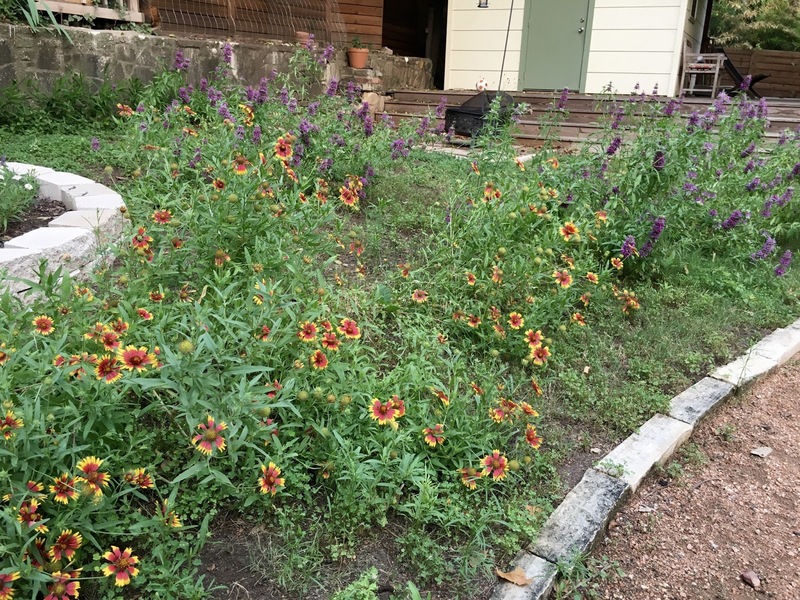 The angle and light in the yard favors Indian blankets and purple horsemint - I can throw gallons of bluebonnet seeds and few pop up. 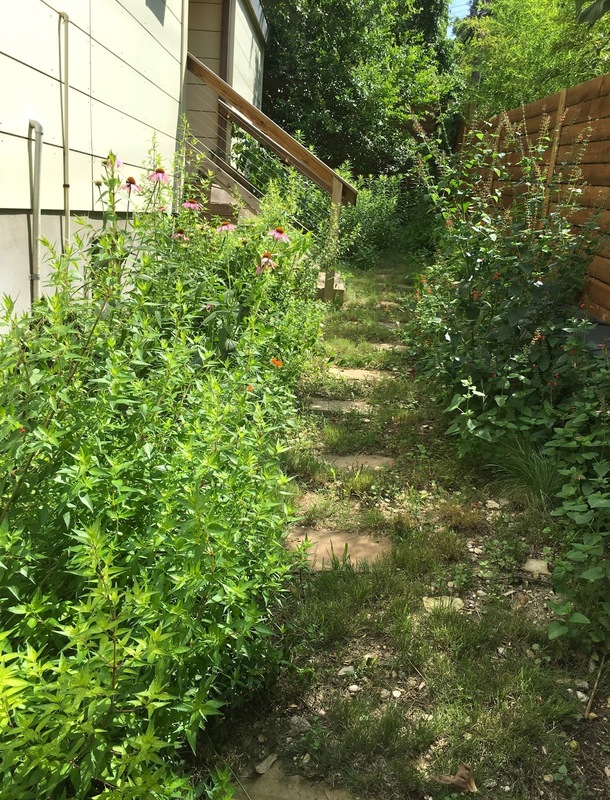 I wasn't sure what the weeds were when they popped up this spring but decided to mow around them and am glad I did! 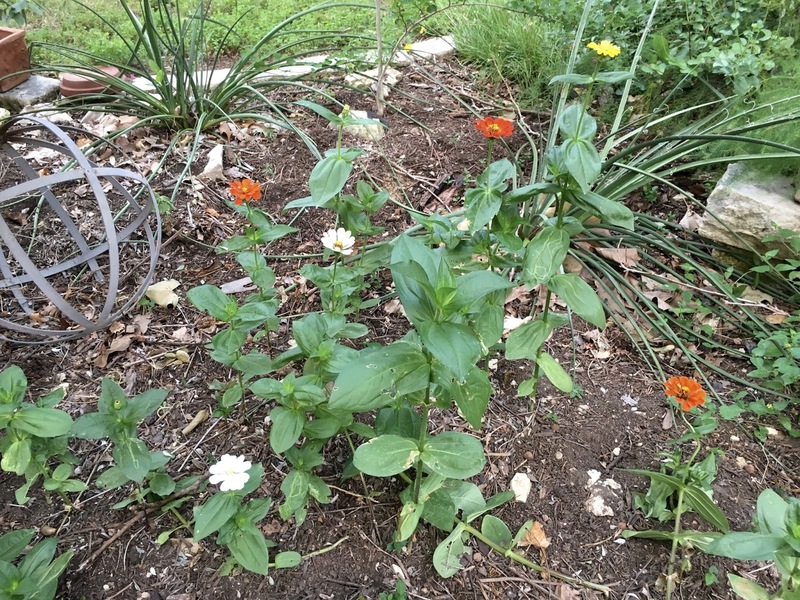 I also have volunteer Engleman daisies and brown eyed Susans bringing cheer. The seeded natives grow easily and without much help. 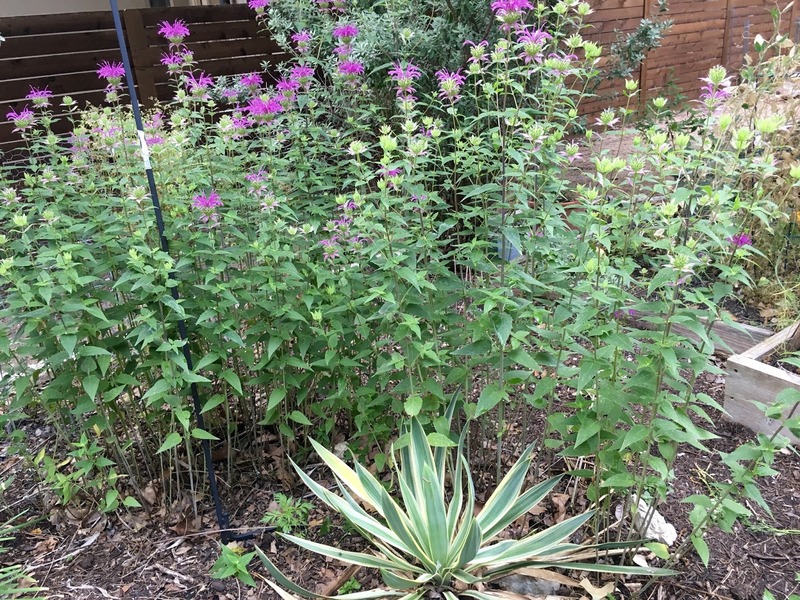 Other (more 'on purpose') plants that are doing well are my Peters Purple monarda, Jerusalem sage mixed with four o'clock daisies and red salvia, and a packet of zinnia seeds filling in a spot that opened after my coral honeysuckle received a massive pruning.. 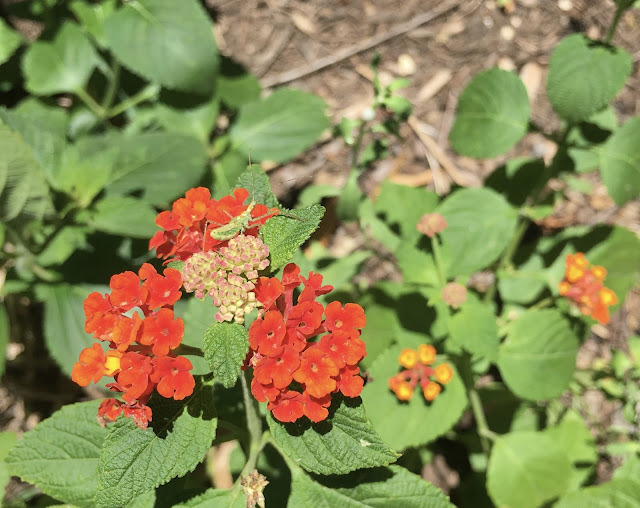 The flowers attract native bees and butterflies, making sitting outside fun..
Up front the lantana is waking up and filling in, attracting a katydid this morning. My tomatoes seem less vigorous this year (maybe not enough compost in the bed? Or I should move them to a different spot to rest the soil next year..). The small ones are starting to ripen though which makes for good snacking. 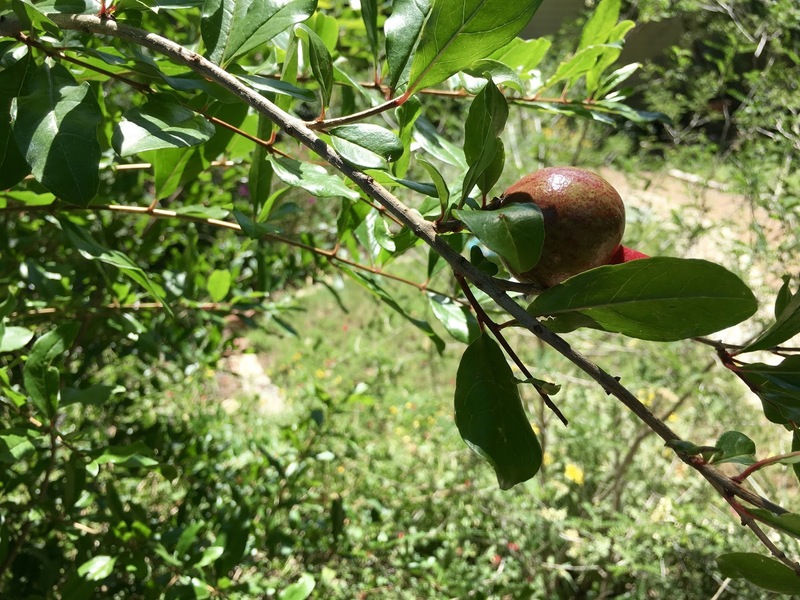 And my two year old pomegranate tree has three fruits growing. I'm hoping the squirrels leave them alone- my boys love the seeds! This was from three weeks ago. I should take an updated pic- the bushy 'weeds' in the xeriscape Thunderturf lawn have turned out to be Indian blankets and purple horsemint which is lovely. 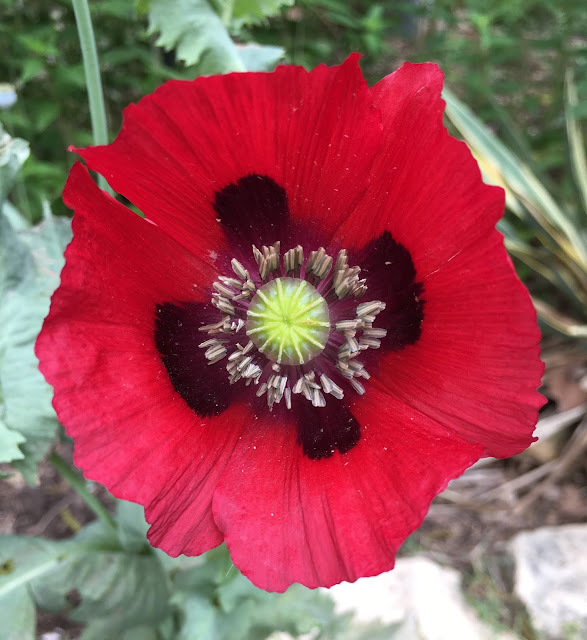 I've had some lovely spring flowers including my self-seeding poppies and a gloriously large orange mallow bush. And we added a puppy (Sasha, acting well behaved in this pic) to the menagerie of chickens, cats and kids. She keeps me walking in the neighborhood, and gets us outside often- which is great. I only planted two tomatoes this year, but they are producing in abundance- yum! 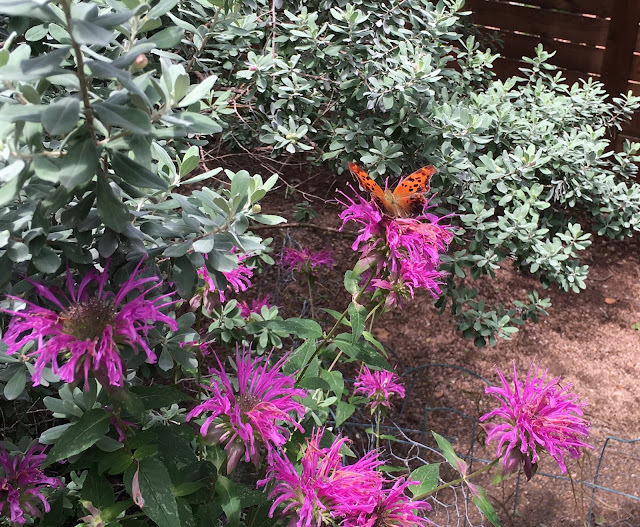 In the middle back my Peter's purple monarda has attracted a Question Mark butterfly and is glowing aside my cenizos (now blooming again today after the rains this week). 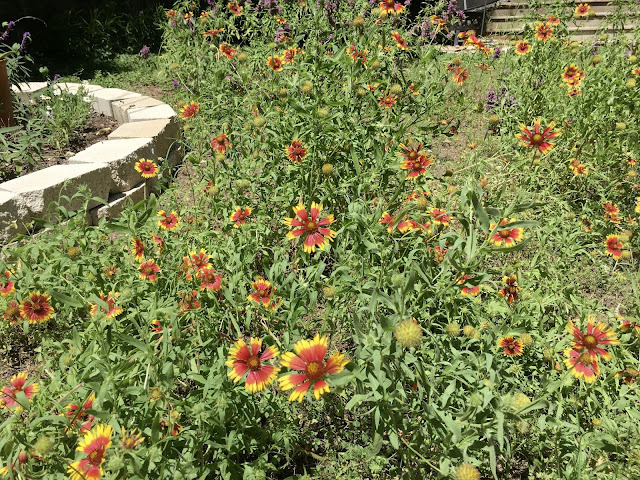 The native grasses are filling into my old lawn space and my wildflower seed areas have fuzzy basketflowers that smell like honey. 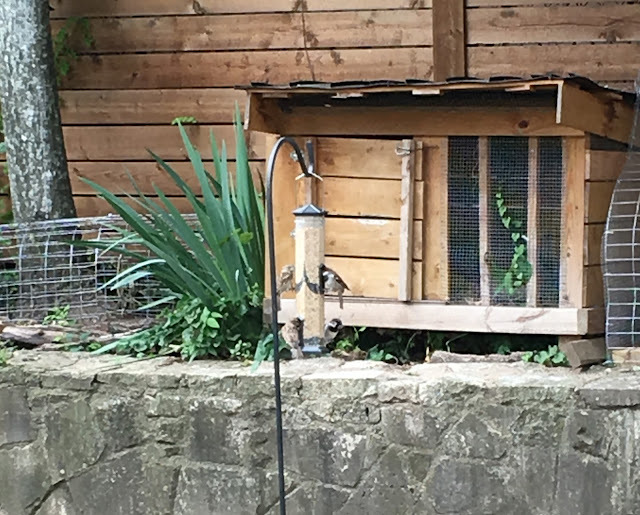 The neighborhood house sparrows (along with the doves, grackles, blue jays and cardinals) empty the bird feeder within hours of filling. In the sunny far back the flame acanthuses (acanthi?) 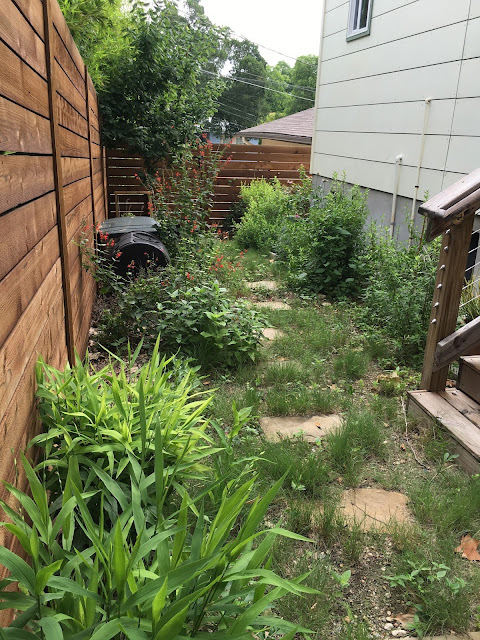 have filled in along with coneflowers, tropical salvia and milkweed. 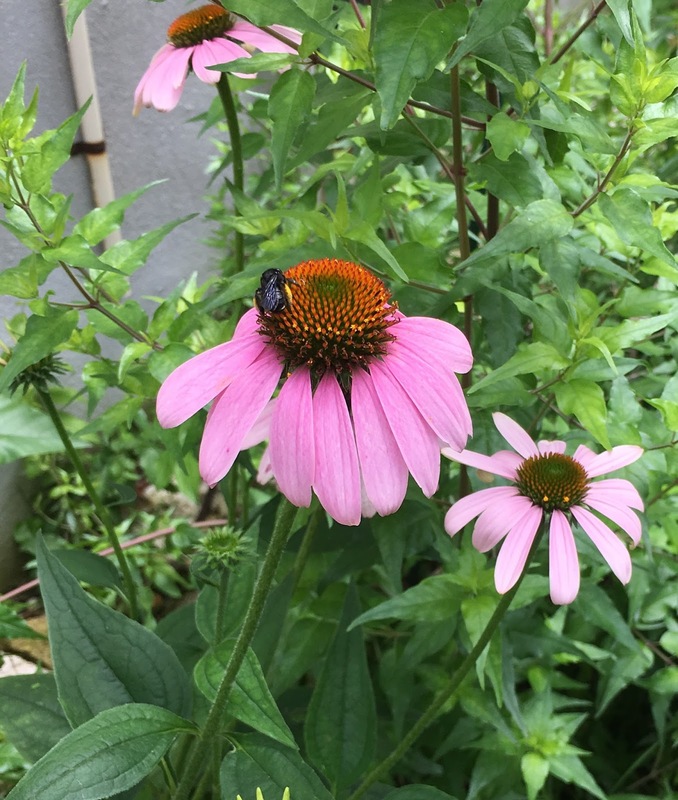 All attract fliers such as horsefly-like carpenter bees (on the coneflower) as well as blue mud dauber wasps (which buzz and flop around me dramatically but leave me alone). 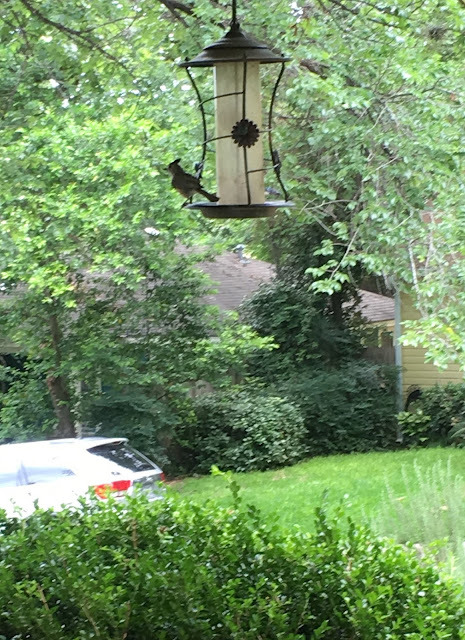 The relocated bird feeder in front of our dining table and front window is also full of activity, from a cardinal pair cheeping from nearby tree branches before dropping down to a sweet titmouse (as well as the requisite too-heavy doves and blue jays). The front bed (reclaimed from lawn a couple of years ago) has filled in with (native or adapted) cottage garden flowers. It is slowly becoming full of coneflowers that reseed every year- no complaints from me! Along the driveway the tough St. Johns Wort (present from before we bought the house 10 years ago) is blooming reliably. 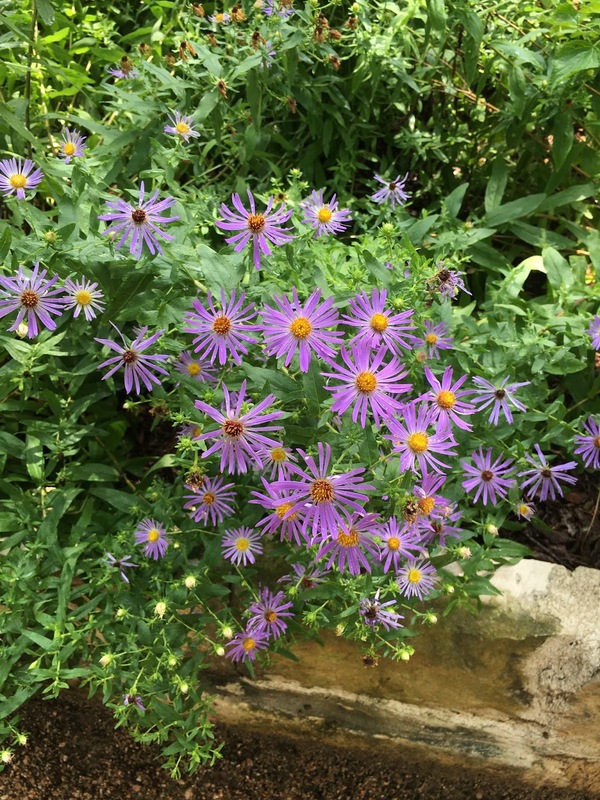 The fall asters have become confused and have put out cheerful purple blooms, too. Everything is lush and the wildlife happy- the native critters and I will enjoy the greenery while it lasts! 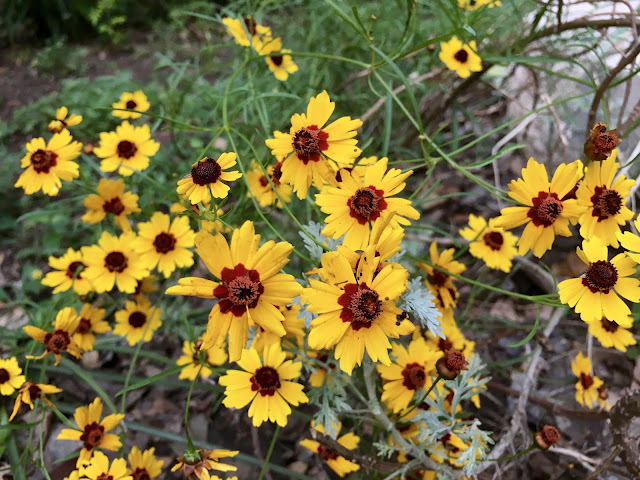 Thanks to Tina at https://mygardenersays.com for hosting Wildlife Wednesday. I have a little of both brightening up the garden this month. 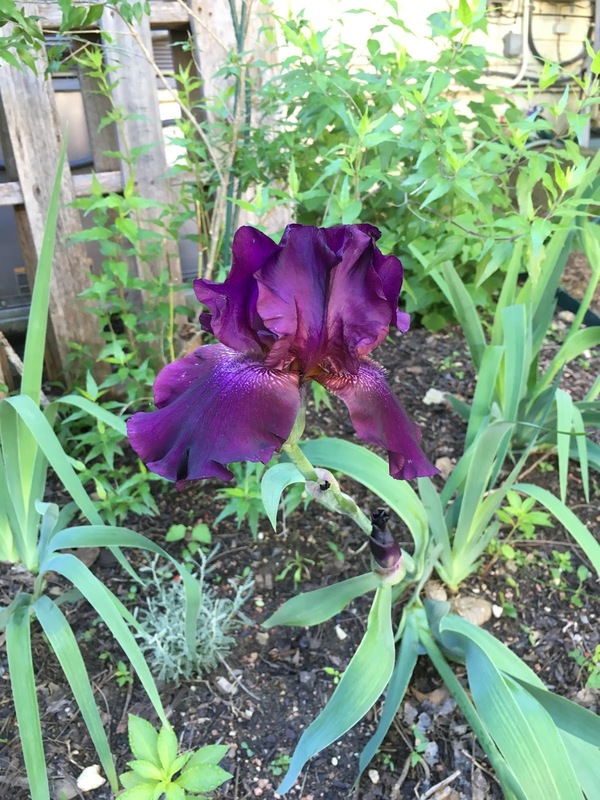 Thanks to Carol at http://www.maydreamsgardens.com for hosting Garden Blogger's Bloom Day. My bearded iris finished blooming a few weeks ago but was lovely to see while it was out. My winecups are my favorite wildflower. I think they make a beautiful groundcover, particularly since the foliage remains throughout the year. 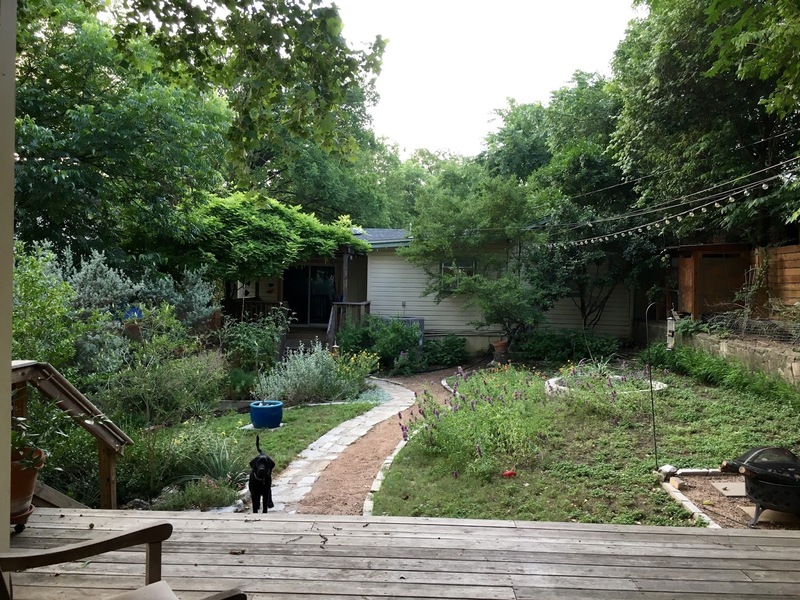 A few of the pink flowers that I have include coneflowers that are spreading happily in the front, my cenizo blooms that follow rains, and a rock rose purslane filling out in a pot. I have been removing these little plants from my crushed granite driveway for years but am now transplanting them to the shady part of my back garden. I believe they are a type of golden grounsel. 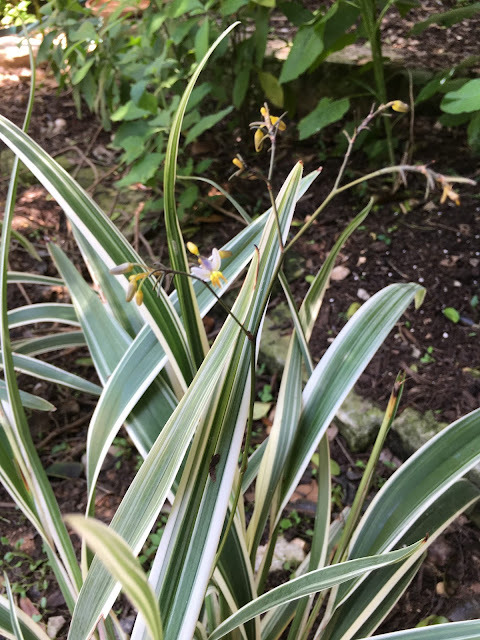 These variegated flax lillies are new as I fill in areas that are recovering from my (formerly free range) chickens. 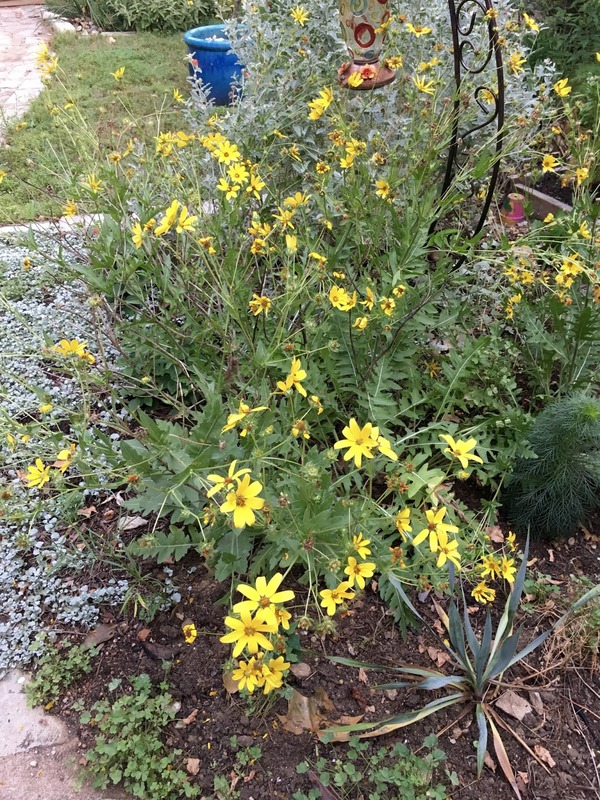 They have little yellow and purple blooms in addition to bright foliage that lightens up their corner. My success with blackfoot daisies is mixed- some explode and bloom vigorously like this one, others not so much. 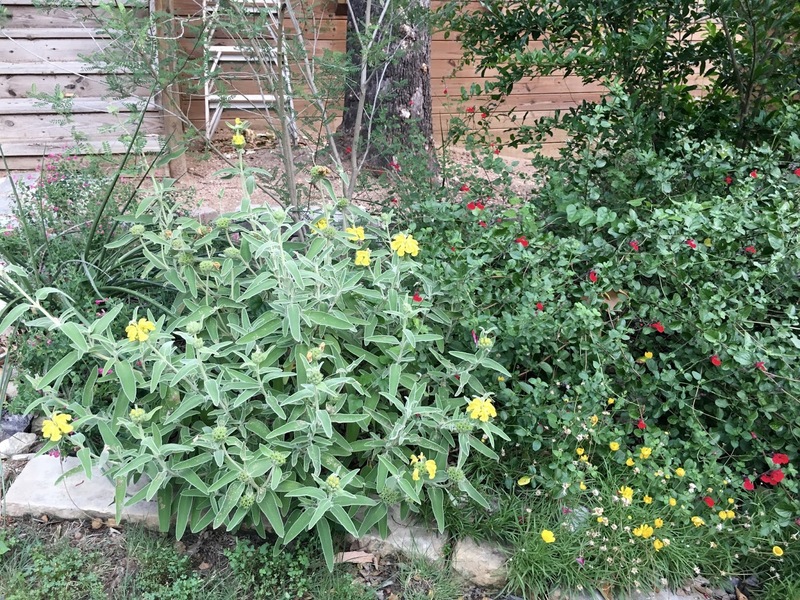 I have a new jerusalem sage to pick up the yellow from surrounding plants (like the agave behind it). They can grow quite large so I've given it room to expand. Wildflower vignette- fleabane, yellow somethings from a seed packet and horseherb that has snuck in. Speaking of horseherb I've decided to take advantage and use it as groundcover in the areas where my buffalo grass won't grow. 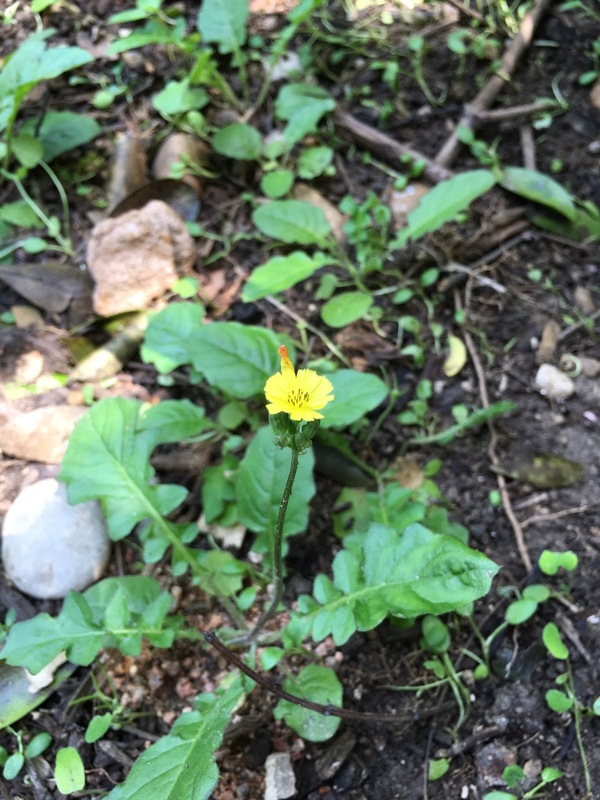 I have plenty of stray plants of it to transplant- this one was formerly in a walkway. I believe I need to trim the salvia greggi back a bit to give the four nerve daisies (the bright yellow flowers leaning over) room to stand up. What do you do with amaryllis bulbs that you think are done after blooming inside? Toss them in the rosemary bed and watch them pop up as a spring surprise. The turks cap in the front has started attracting hummingbirds. It is mixed with white mistflower that blooms later. The primary bloomer in the back back area right now are multiple tropical salvias that spread everywhere. They get ragged quickly but attract so many butterflies, bees and wasps (like the one above) that I keep them. I just mow through the middle to keep a walkway. Finally, these succulents are not blooming but have a beautiful flower pattern anyway. This was a mother's day present for my mom this year. Welcome to my spot for musing about my seasonal pleasures: gardening in the spring/summer/fall and knitting in the winter. I believe in that 'work-life balance' thing, so this blog happily ignores work and focuses on the other things I do that make me happy. 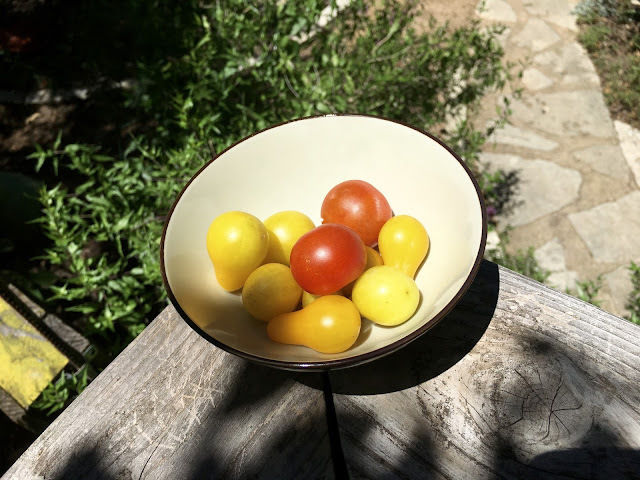 Rocking The Homestead | Where sustainability, feminism, parenting, and rock and roll intersect. 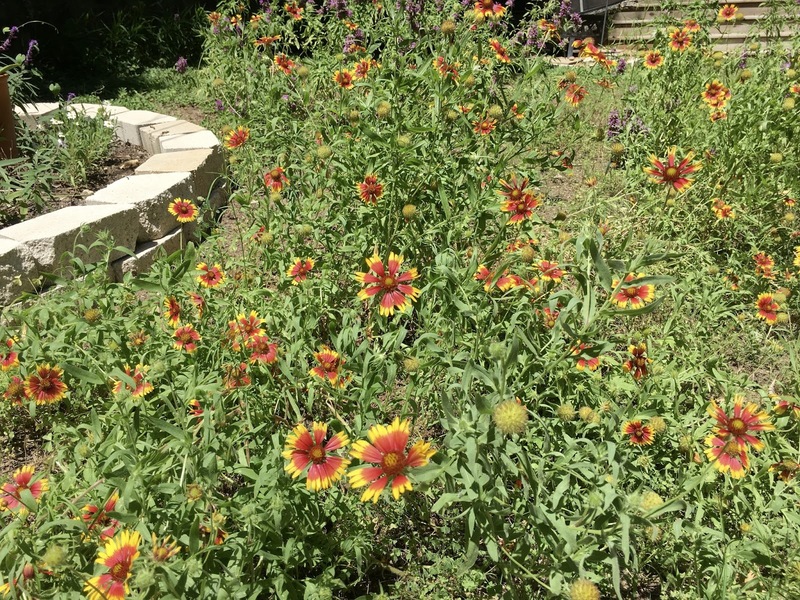 Victory or Death!in the Garden | For the native Texas plants in this native Texan's garden, anything but death is a victory! loveschickens | Info and articles on chickens as well as other pets!